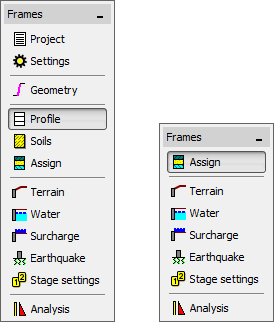 The vertical tool bars let the user select the desired mode of inputting data (Project, Geometry, Profile etc.) including analysis type and verification. Selection of the mode from this bar displays in the bottom part of the desktop the corresponding frame for data input. The tool bar only contains those frames, where the input of data makes sense. This means, that if a task has more construction stages, the tool bar is complete, however some items are missing in further construction stages. Data cannot be changed in the missing frames.